The skins of Trinity Bars made available for the addon Masque (formally Button Facade). - Updated the graphics a bit, made them cleaner, smoother. - Small changes to skins to support the new color data structure that Button Facade now uses. - Typo on the round button colors made them lilac :) Fixed! - Added some colors to the Trinity skins. I love the art of your buttons, but I'm having a problem. I've downloaded ButtonFacade and your xpac, but when I try to use them in a compatible add-on (Aura Frames), I get this strange (and rather ugly, IMO) green border. Looking at the image on this site of your buttons, that border shouldn't be there. It's on diamonds, circles and hexagons. I have a really stupid question, Under the "Addon Setting" section, its all blank, I've tried to turn off all other addons in my folder but still it does not show the settings, it's just blank. Am i missing some addon or doing something wrong here? The module part is working fine but settings are not. This is a good addon that i used on my old computer and now its not working. 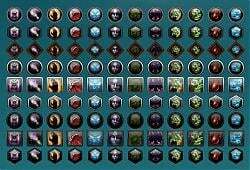 Would it be possible to make a button facade that would allow "dressing up" the XP bar and Reputation bar? I noticed that the Adornment square/etc skins were included with this...it's just too.. .."smoky" for me I guess? The simple 2 toned flat borders of trinity were good enough for me. Last edited by sietelle : 10-20-08 at 10:34 PM. Yes, if you have the Button Facade addon itself. Might seem a dumb question since this mod is flagged as being compatible with 3.0, but does it work with Macaroon? Are you using Vista? Did you tell WoW to use the public folder for settings? I am still trying to figure out what is happening, but settings not saving on several addons seem to be related to this. I have the add on in my folder and can see it in the log on screen but its not there in my interface to edit?, is this a MAC issue maybe? Hi Maul. I have a question for you. 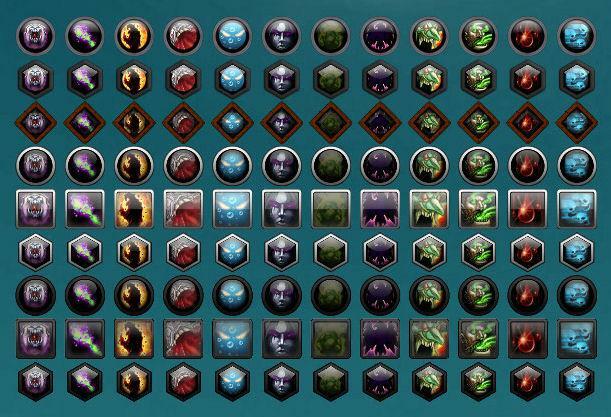 Specifically for the Hex skin, I'm curious to know how you got the icon so that the corners don't show outside the hex border. Did you make some kind of mask for the icon? I'm creating my own BF skin that's round. If I make the icon small enough so that the corners aren't peeking out on the outside of the skin, then I get a leak inside the button. There is no masking of WoW graphics in the sense of traditional graphics editing. Second, once I get the icon to the size I want, I see how much of the "squareness" is exposed on the inside of the skin. Once I do that, I created an alpha layer to "blackout" those areas. Again, this can be a pain-staking process to get right. You can also see this "blackout" alpha layer technique in the round skin of CyCircled/Button Facade, except they do it on the outside of the button. If you look closely, you can see the black ring on the skins. That black ring hides the corners that extend beyond the outside edge of the skin. I prefer the technique I use (inner black mask/ring) as it gives the buttons a "crisper" look, imho. Last edited by Maul : 09-14-08 at 09:36 AM.